Lift your spirits! Long live the women! 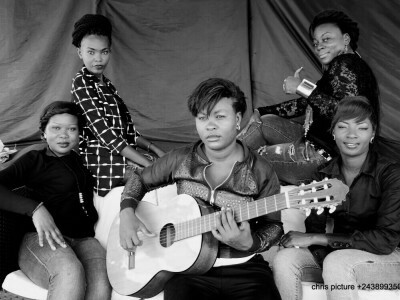 Nkento Bakaji is a Congolese musical group composed solely of women. They were 15 years old when the entire troupe came together to showcase their various talents. Music lovers and masters, they perfectly play all instruments and take us on a musical journey with through salsa, rumba, reggae and many other rhythms. The name of their group "Nkento Bakaji" is drawn from Kikongo and Tshiluba, two languages spoken in the DRC, and means "Women". Their fight their battles through the medium of the music, showing and demonstrating that women are capable of doing anything by using their skills to guarantee their rights. The Nkento Bakaji are driven by a great name of Congolese music namely producer Louis Onema. It was with him that they recorded their first album entitled "Amboka". An opus with different rhythms and influences for the pleasure of all music lovers.